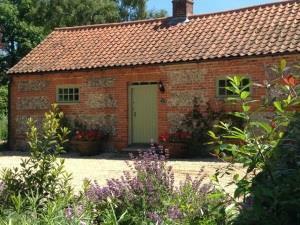 Dockings Cottage @ Hindringham Hall01328 878226work Self-cateringA 4* Gold award cottage which is ideal for dog owners or visitors needing accommodation on one level. Enter into an open plan living room with dining area and walk through to a modern kitchen and French windows onto the rear fenced garden. Quality oak floors throughout the living accommodation and carpeted bedroom at either end of the cottage with en-suite bathrooms to both the twin and double bedded rooms. The beautiful gardens of Hindringham Hall are free to guests and there is a hard tennis court for visitors to use. Just 10 minutes from the beautiful North Norfolk Coast and within easy reach of all that Norfolk has to offer-this is the ideal location for a Norfolk holiday. A 4* Gold award cottage which is ideal for dog owners or visitors needing accommodation on one level. Enter into an open plan living room with dining area and walk through to a modern kitchen and French windows onto the rear fenced garden. Quality oak floors throughout the living accommodation and carpeted bedroom at either end of the cottage with en-suite bathrooms to both the twin and double bedded rooms.